Transparent commands are nothing new in Civil 3D. They provide shortcuts whenever Civil 3D is looking for points, when one can reference alignments, profile views, Northings and Eastings, etc. They are still accessible through a toolbar placed by default along the right edge of the Civil 3D drawing areas shown. The only other toolbar routinely used in Civil 3D is the Point Filter, placed by default directly below the Transparent Commands toolbar. These Point Filters are used only when prompted for a point location during the certain transparent commands, such as when specifying Bearing/Distance, Azimuth/Distance, Distance/Distance, etc. However, in 2019.2, these transparent commands and point filters are also placed in the ribbons and have their own dedicated tab. They also are in the right-click menu when locating a point. The additions of these valuable tools into the standard Civil 3D ribbons and right-click menu make them more accessible and useful. Furthermore, when using the Station Offset Transparent command (in the Plan panel), another ribbon appears where one can select different alignments and type in Station and Offsets, rather than typing them in on the command line or picking them on the screen. By adding these tools to the ribbon and right-click menu, the toolbars are no longer needed. However, they are still loaded in the standard CUI of Civil 3D. Thank you everyone who was able to attend our recent Webinar A Coming Convergence? Revit and Advance Steel Interoperability. If you didn’t have a chance to listen in or would like a refresher here is a link to the video on our ASCENT YouTube channel. As always I like to follow up webcasts with the questions that come in. These always make me think a bit more too. Several of the questions deal with when should you use Autodesk Revit or Advance Steel. This depends on the Level of Development (LOD) that you want to achieve. Other questions dealt with some import/export options that I have outlined below. Question: Do you see many AEC firms modeling joints? We do not model but create details in drafting views instead. What is the benefit of modeling what are often hidden joints? Creating details in drafting views is considered LOD 300 and is appropriate for the design phase of a project. If you are not designing to LOD 400 for fabrication you do not need to use Advance Steel. Comment: I found this somewhat confusing given the overlap in functionality­, but it is pretty impressive. an eye opener for me. There is a lot of overlap in the functionality. This is primarily because the two products developed separately for different types of users.­ With Autodesk focusing more collaboration and interoperability they have added functionality to Revit that was not there before. As I mentioned in the webcast, there is still room for both software products. Will we see a full convergence in the future? I don’t know. Question: ­Is there a logical point that you can take your structural design in Revit and then export to Advance Steel? Is this a sales / marketing workflow or do you recommend one over the other? You can import the Revit model into Advance Steel as early in the process as makes sense for your project. But, in most cases you won’t do this until you get ready to fabricate the parts. I could see doing it earlier if you were a design/build firm and wanted a faster turn-around and had very tight communication between the designers and fabricators. If you are two different firms then you probably don’t want to do it too early. The idea of importing the Revit model is to save time for the fabricators so they don’t have to rebuild the model from scratch. Question: How do the railings and stairs come in to Revit? Are they Revit railings/stairs or just elements­. When you create railings and stairs in Advance Steel they are put together from individual elements but are grouped together in a way that you can modify each of the components as shown below. When the stairs are imported into Revit they become the individual elements (as shown below) because the group properties do not import at this time. Comment: There is a setting when you export the Revit file to SMLX that lets you turn off beam shortenings. Importing a file from Revit to Advance Steel includes beam shortenings by default as you can see below. This causes a problem if you are trying to add Advance Steel connections. In 2018 there was a setting where you could do this when you exported the Revit file to SMLX but it is no longer available in 2019. The shortening objects need to be deleted in Advance Steel after you have imported the file. See this link to the Autodesk Knowledge Network for more information. Question: Is there an Advance Steel manual? Yes, you can get Autodesk Advance Steel 2018 Fundamentals from our website. It is fascinating to see all the changes that have come about in the last several years where teams that once had limited coordination are now working on the same models in many cases. Collaboration is the word of the day. The overlapping tools and close to seamless connections between Revit and Advance Steel make this collaboration much easier. It will be interesting to see what will happen in the future. We looked at very simple structures in this webcast but many buildings have much more complex structural modeling going on. I’m waiting to see the full Revit design to construction process via some humongous 3D printer at some point! Viewing or selecting references in components of a large assembly can be challenging. 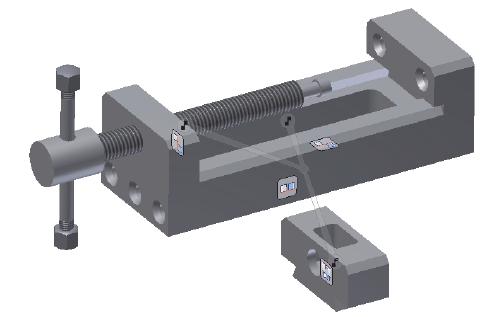 Moving and rotating components is a simple way of temporarily relocating assembly components. 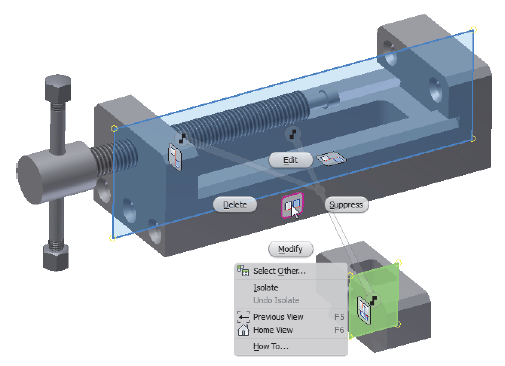 To move components in an assembly, click (Free Move) in the Assemble tab > Position panel, and select the component to move in the graphics window. Alternatively, you can select the component in the graphics window, right-click and select Free Move. Hold the left mouse button, and drag the component to a new location. Once you have moved the component, release the mouse button to drop the component. If the component being moved is constrained, the Free Move command displays relationships as elastic bands between the constraint references. Icons indicate the original constraint type. Relationships are not displayed between unconstrained components. Select any of the constraint icons once a moved component has been placed and right-click to display the marking menu. The commands in the marking menu enable you to Edit, Suppress, Delete, or Modify (offset value) the selected constraint. This is a short excerpt from ASCENT's learning guide, Autodesk Inventor 2019 Introduction to Solid Modeling.